If you're in management, you are almost certainly making presentations routinely. It's easy, but incorrect, to think of your presentation as a bunch of bulleted lists in Powerpoint slides. Technical managers, in particular, are notorious for conceiving of their presentations in this way. The truth is that every presentation you create and deliver is an opportunity for you to communicate your message, persuade your audience and get the action you require as a response. So how do you go about creating presentations that accomplish this? In #PRESENTATION tweet Book, Wayne distills for you the best of the best presentation tips, painstakingly gathered from expert presenters across Cisco. He presents the tips in the ever-popular tweet format, allowing you to absorb the wisdom readily and put it directly into action. You will learn to fine-tune your presentation to its key points, deliver it with authority and style, create and present webinars, and more. From how to speak to engineers, to presenting webcasts that keep your audience attentive, Wayne brings you practical, solid advice from people who sell, persuade and teach successfully every single day. 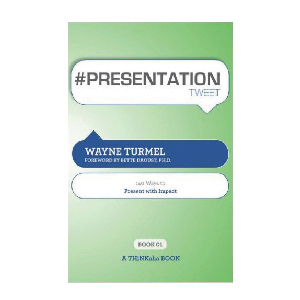 If your work requires you to present effectively in a business situation, whether to a technical or a non-technical audience, #PRESENTATION tweet Book contains gathered wisdom to ensure that your next presentation gets you the attention and results you want.